Your fitness is important—that's why our Crosstrail Sport focuses on seamlessly blending comfort versatility and efficiency. It comes equipped with a suspension fork with our Fitness Brain technology that can tell the difference between pedaling inputs and trail bumps so you won't be wasting any energy on your climbs. And to build on this blend of comfort and speed the frame is built from respectably light and rugged A1 SL Premium aluminium with a geometry that's made to fit just right from the minute you get on the bike. Your fitness is important—thats why our Crosstrail Sport focuses on seamlessly blending comfort versatility and efficiency. It comes equipped with a suspension fork with our Fitness Brain technology that can tell the difference between pedaling inputs and trail bumps so you wont be wasting any energy on your climbs. And to build on this blend of comfort and speed the frame is built from respectably light and rugged A1 SL Premium aluminium with a geometry thats made to fit just right from the minute you get on the bike. Add in a mix of workhorse components from the likes of Shimano and microSHIFT powerful Tektro hydraulic disc brakes and rack/fender mounts and were sure that youll be mixing it up quite a bit on your road to hitting your goals. Working with our Body Geometry team we designed a frame that strikes the optimal balance between comfort and efficiency. The A1 SL Premium aluminum construction pairs weight savings with rugged durability while the rack fender and disc mounts give you an incredibly versatile package. An SR Suntour NEX fork w/ Fitness Brain technology features 55mm of coil-sprung travel that takes the sting out of bumpy terrain while our Fitness Brain technology promotes more climbing and pedaling efficiency. Braking duties are handled by Tektro Vela hydraulic disc brakes to ensure effective consistent and reliable power through any kind of terrain or condition. 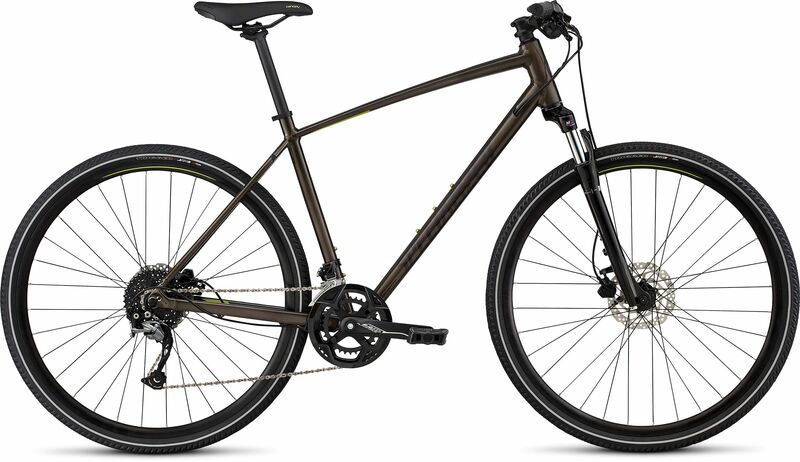 Please see below for delivery options for Specialized Crosstrail Sport Sports Hybrid Bike 2019.